This room is well crafted and meets all the necessary requirements of a living room. 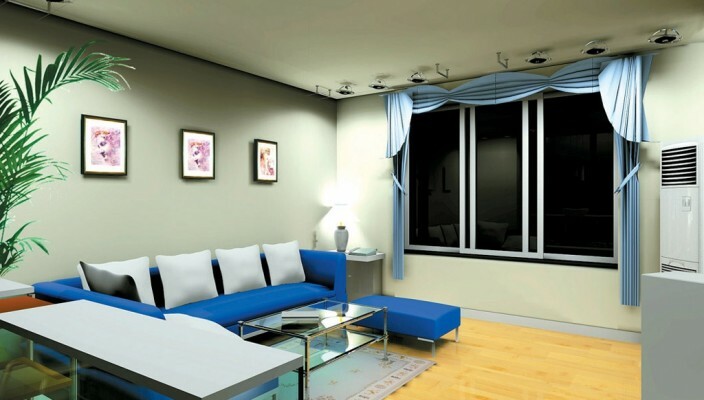 The room looks complete in its furniture, color, equipments and design. The colors complement each other and are chosen with great care and precaution. The room looks full and complete in all aspects. The centre table is complementary to the entire sofa set. The indoor plant adds beauty and hint of nature in the room. The window size is ample to take a view out and the curtains are very creative and appealing to the room. There is a column air conditioner to maintain the temperature in hot weather. The lightings on the ceiling serve the dual purpose of adding a show as wels a sparking glow to the room. The table right in front has a multiple purpose use and a stunning and creative feature of this living room.